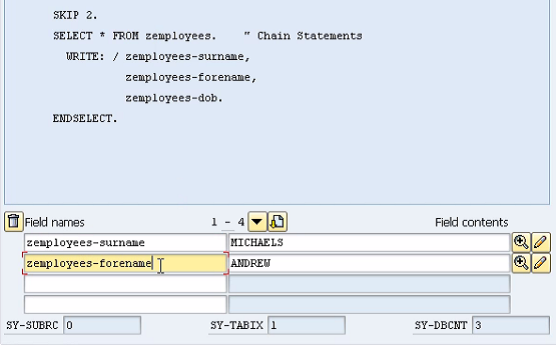 Note that, since here a table is involved, in the field name section the name of the table must first be specified, followed by a -, then the name of the field. The field contents will be filled in automatically. As you step through code line-by-line in the SELECT loop, the text held in each field will change as each loop completes and moves onto the next record in the table. This section allows for 8 fields to be monitored at any time. Fields 5 - 8 can be made visible via the navigation buttons in the middle (to the right of the numbers 1 – 4).